PM reportedly conveys message to New Right chairman that it would be better not to attack one another during the election campaign. Prime Minister Binyamin Netanyahu on Sunday conveyed a message to New Right chairman Naftali Bennett, in which he said that he was not interested in mutual attacks during the election campaign. According to a report on Kan 11 News, Netanyahu is concerned about the attacks within the right and wishes to calm down Minister Bennett, who accuses him of a planning to deliberately uprooting communities after the elections. Earlier on Sunday, Bennett weighed in on the Trump peace plan and claimed that a plan to establish a Palestinian state will be presented immediately after elections. "Prime Minister Netanyahu and President Trump are in agreement on launching the plan to establish a Palestinian state immediately after the elections,” he said. 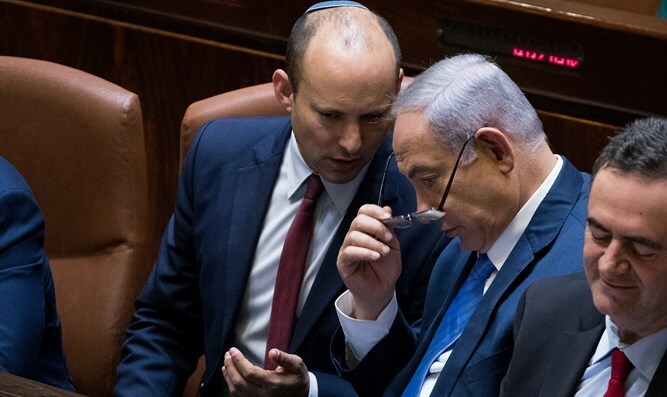 “They are coordinated not to present the plan before the elections so as not to make it difficult for Netanyahu, but a day or two after the elections the plan for the establishment of a Palestinian state on 90% of the area and the division of Jerusalem will be presented,” added Bennett. Likud blasted the assertion, calling it a "complete invention with no connection to reality. After the elections Netanyahu will establish a right-wing government headed by himself." Meanwhile, a new poll published on Sunday found that the Blue and White alliance of Benny Gantz’s Israel Resilience party and Yair Lapid’s Yesh Atid faction would become the largest party in the Knesset if new elections were held today, but the right-wing-religious bloc would retain a narrow majority. According to the poll, conducted by Maagar Mohot and published by i24NEWS and Israel Hayom, if new elections were held today, Blue and White would win 36 seats. The Likud, by contrast, would gain a single mandate over its 2015 performance, winning a total of 31 seats. But the right-wing and haredi parties would retain their majority in the Knesset, though by a razor-thin margin, with 62 seats to 58 for the left-wing – Arab bloc. The New Right, led by Education Minister Naftali Bennett, would become the third largest party with nine seats, following by Labor with eight. Tied with Labor for fourth place is the Jewish Home-National Union-Otzma Yehudit alliance with eight seats. Both of the haredi parties, United Torah Judaism and Shas, would win seven seats each, as would Meretz. Yisrael Beytenu, Kulanu, Gesher, and the Balad-United Arab List alliance would all fail to pass the electoral threshold.